Why are you poisoning yourself? I was hurt – very hurt. Someone had said an untruth that bothered me tremendously. I felt angry, betrayed and resentful. Everything I said and touched started to turn to stone. My heart became hardened. I wanted to feel the anger – conversations always led back to how hurt I felt. I knew it was wrong. I felt torn in two, worn out. I was stuck in “unforgiveness”. I recall those feelings now. I don’t have them anymore. I was able to forgive and find peace. How? How did I do that? Here are 6 things you need to know before you can start on the road to forgiveness. Yes Let go – Forgiveness means a decision to let go of resentment or anger. It does not mean a denial of what happened or that the act is justified. But we need to LET GO. How can we do that? Did you hear that the definition says that we don’t condone what was done? But we let go of it. It is something that will happen supernaturally as you follow through these steps. But you need to keep it in the front of your mind as I go through the steps. Remember Let Go. 2. Ask yourself – What are the pitfalls of not forgiving? You may ask what if I do forgive – how will that help me? I want to stay angry. I feel like I deserve the right to be angry. I’ve been hurt and want to feel the pain. My answer is, you do have that right to keep the anger. We have free will. But what does anger do to you – to your body, mind and soul. It does everything you don’t want it to do. It makes you sick. You may ache physically from tenseness. You may have headaches, fatigue, weight gain, weight loss, or depression. These are things that could happen if you keep the anger. That doesn’t sound too delightful does it? Corroding of the bones – brittle bones, disintegrating, useless. 3. Check out what you may be missing without forgiving. There are good things that happen to you when you forgive. Besides better health your face changes, you smile more often. You see goodness around you (by the way it was there before). And as a Christian how do we want others to see us – as angry, or as loving, peacemaking people? God wants us to forgive others and He says that unless we do so how will God forgive us of our sins (and we do have them, don’t we?). When we are fraught with anxiety, fear and anger we can’t find God. “Unforgiveness” does that – it blocks the goodness around us. It blocks our relationship with God. Be kind to your friends and become a loving person once again. If you are truthful you will hear how you are acting around others. Remember we all sin. So if someone has sinned against you – be a peacemaker and forgive them so that when the tables are turned you too will receive forgiveness. We are not perfect – not one of us. How do you know when you are going to go down that path and do something to someone else? You may not even know it – and they might be upset with something you said and did. So really – don’t fret the small stuff. There are many other things that will happen and this area that is upsetting you now will seem trivial in the future. Remember the saying, Do under others as you would have them do to you. This really should be step one but you had to find out why you needed to give up the “unforgiveness” before I gave you this step. Yes He can’t change your emotions but He can help you change them, He can help you find peace, He can help you know Him and His ways which are higher than any other way. If God says to do it – Do it. And do it right now. Don’t wait because God says we are to do it right away – not to let the sun go down. Get rid of it – now. Ask God to help you get rid of this “unforgiveness” – and then release it to Him – right now. I will be praying for everyone who is harbouring a grudge or living in an unforgiving state. Give yourself a break and give it over to God. Lord, this “unforgiveness” is one of the hardest things we face in our life here on earth. You talked about it in Your Word. You said we have to forgive. Period. So Lord I give over any feelings, emotions, or hardness of heart that I have resting in me. I ask You to cleanse me of all of it. Even the stuff I don’t know about. Give me a clean heart before you. In Jesus’ name. Amen. Until next time read Colossians 3:13. Remember to bear with each other and let the world know we are Christians by our love for one another. This entry was posted in Hope Stream Radio and tagged forgiveness, God, peace, prayer, Scripture, unforgiveness on July 10, 2017 by JanisCox. How do we find life and peace? I have been reading a devotional every morning from UCB Canada written by Bob and Debby Gass. Today’s thoughts were great and have been setting the tone for my sabbatical this summer and I felt a need to share them. Have a true faith: On Sunday the sermon was all about faith, taking words from Hebrews 11. Faith is more than belief. Faith is built on a firm foundation and in things we can’t see. Be with others of our faith: Stir each other on. Watch your thoughts: Remember the “whatevers” as they mean a lot. See Philippians 4:8. Be thankful: As you go to sleep and when you wake up – don’t forget to thank God. My favourite book about this is Ann Voskamps’ One Thousand Gifts. Watch out for the world: What is keeping you away from God? What books do you read? TV? Media? What fills your thoughts and mind? Maybe you need to take a sabbatical from all things that turn your mind away from God. Be merciful: Remember God is merciful to us. Don’t harden your hearts against anyone. Forgive: To me this is the top one for peace. God forgives us and calls on us to forgive others. You don’t have to like the person but you do have to forgive them. If you have problems, ask God for help. Love your enemies: Do you have people you disagree with? Pray for them. Love them. You don’t have to agree with them to love them. And don’t forget to pray for those in authority. Tell others the truth about the Gospel: This is something we all need to do more. Speak your faith story. Be specific. What is God doing in your life? Tell others about the saving grace of Jesus. I am grateful to have read this today. I am keeping a copy of it for myself. Feel free to save the photo and post it on your bulletin board or share anywhere. Time for today’s linkup. This is Word of God Speak. Please join us in posting or reading wonderful words of what God is doing in our lives. Let’s build each other up. This entry was posted in Word of God Speak and tagged 10 tips to life and peace, faith, life, peace, Scripture, the world, Word of God Speak on August 20, 2016 by JanisCox. Today is the second week of prayer scriptures. This week I am looking at my favourite one and the first one I memorized. Philippians 4:6-7. Do not be anxious. That says it all. How can we not worry? How can we not be afraid in this world we are inhabiting? Read on. Check here for other versions. BibleGateway. I memorized this one many years ago. But this week God led me to someone singing it to help us memorize it. Check it out on Youtube. If you haven’t memorized it yet this certainly will help. Anxiety and prayer are two opposing forces in the Christian experience. 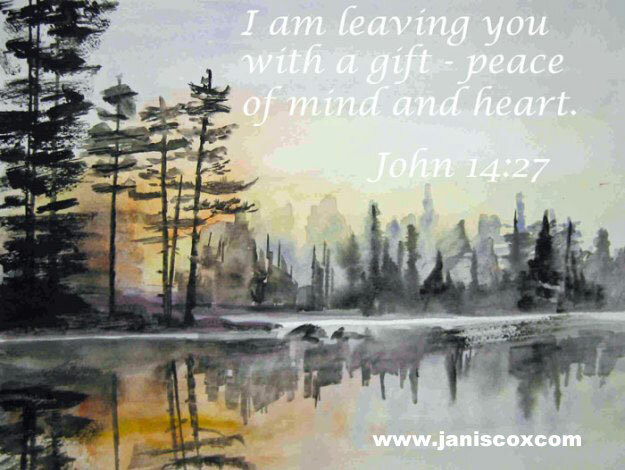 Peace – an inner peace can be found by letting it all be given to Jesus. I love this song, I’m Trading my Sorrows. It sings: Prayer is a powerful weapon. Strongholds come tumbling down. I made this the first scripture to memorize because I was filled with fear and worry. This helped to take away the fear. I kept repeating this passage over and over until it became part of me. In everything – love those words. It reminds be of the widow woman who gave “everything”. It doesn’t say – sometimes, or often, or once in a while, or when I think I need Him. But in everything I do – always, that means in all ways. Prayer, Petition and Giving Thanks. That reminds me of one of the ways we can pray using A.C.T.S. A few weeks ago I held a contest for a book called Peace for a Lifetime by Lisa Murray. 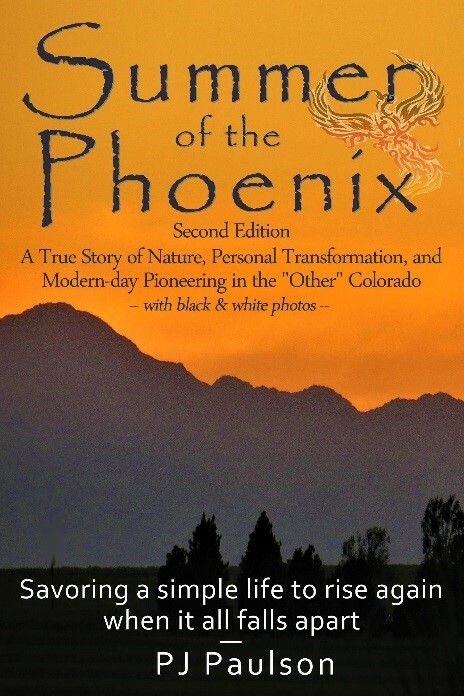 If you are struggling with finding peace in this world this book is for you. I have always found that taking a deep breath is the first thing I need to do when things are turned upside down. Breathe in deeply. Tell God that You know He is there with you and will remain with you through this trial. God will be there no matter what. He says: I am yours. I always wonder how I found this peace that I have now. It is all God. It is all because of Jesus and what He has done for me. For those struggling, I know it doesn’t seem possible but God can and will pull you through. Let Him wrap you up in His arms. Allow God to give you His love. Allow God to fill you with peace. In Genesis 2:7 we hear that God breathed life into Adam and he became a living being. Jesus can do the same for us. Let Him breathe life back into you. Jesus came to save us from worry and fear. Let Him help you. Let Him help you to say: Do not be anxious. Father, thank You for Your peace, the peace that passes all understanding as Jesus guards and protects our hearts and minds from the cares of this world. Help us to remember that prayer can combat worry. Let us breathe in the Holy Spirit and exhale all strife. In Jesus’ name. Amen. Then starting April 11, I will be joining in with 17 New Testament Books in 17 Weeks. Join me by clicking here. I am excited to see what others are saying on these books as I study each passage using the S.I.M.P.L.E. Method of Bible Study. Please add your links for any posts that are faith-based. This entry was posted in Word of God Speak and tagged Acts, Christ Jesus, peace, petition, Philippians 4:6-7, pray-ers, prayer, thanks, worry on April 9, 2016 by JanisCox. This week on Word of God Speak I looked at three scriptures in review. One about joy and peace, kept surrounding me. Joy and peace. Lovely words. I called my podcast How God’s Word Can Fill You and Overflow to Others. You can listen to my podcast at Hope Stream Radio. Or if you want to read instead of listen, my show notes can be found below. 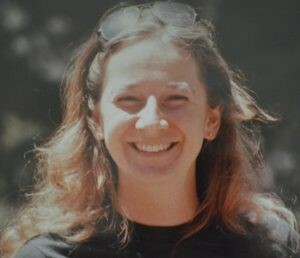 This became a healing balm to her troubled spirit and a starting point for recovery. That’s one little verse. Such a powerful impact with God behind it. Can you picture this verse? As we read His Word and pray, God pours out joy and peace into our hearts. Then that joy and peace continue to fill us, and we overflow so others may see God in us. The Holy Spirit works in our lives, for us and for others. For it is God who works in you to will and act in order to fulfill His good purpose. I see God working in my life. I study the scriptures; He fills me; He sends me to those in need; He fills them with the Scriptures and they overflow. Others are filled. Or I stumble; He sends His Word from others who read the scriptures; I take them to my heart; I heal; I overflow and give to others. Is God calling you? What have you learned from His Word this week? I would love if you shared your journey with God with me. 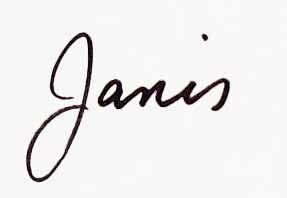 Drop over to janiscox.com and send me a note. This is the way we sang it on Sunday. Even with the oh oh ohs. We can hear God Speak if we listen to His Word. If you haven’t asked Him to reveal His Word to you – first open your Bible, then pray for God to open His Word to you. Then read and listen. It’s that simple. Lord, in all we do, say and think, in all our lives, we ask you to fill us with Your hope by the power of the Holy Spirit. As we open our hearts to you, worship You and read Your Word, may we not only be filled but may we overflow with Your hope so others may come to know You. In Jesus’ name. Amen. Until next week, may Christ be Your Cornerstone. May you have a week filled with His love, mercy and power. May you open His Word and let Him speak to you. 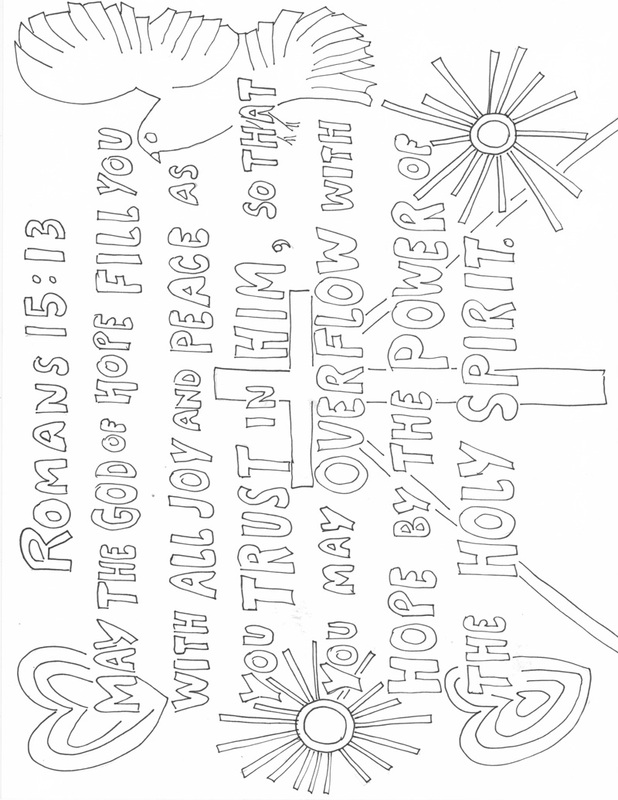 This entry was posted in Hope Stream Radio and tagged colouring page, fill up, free download, hope, Hope Stream Radio, joy, peace, podcast, Romans 15:13 on February 10, 2016 by JanisCox. Hope Stream Radio Podcast – How Can you PACE yourself this Christmas? Today on Hope Stream Radio I talk about How Can I Find Peace This Christmas? I also talk about everything hinging on your PACE. I have never been so confused with the order of the advent candles. When I researched it tonight it was all over the place. So I am going with PEACE for the fourth Sunday even though my pastor said it was JOY. So confusing. As we walk toward Christmas let’s let the Holy Spirit speak into our lives and find the peace we need at all times. Come to me, all who labor and are heavy laden, and I will give you rest. Take my yoke upon you, and learn from me, for I am gentle and lowly in heart, and you will find rest for your souls (Luke 11:28-29, ESV). I will see you on the weekend with the next Word of God Speak. This entry was posted in Hope Stream Radio and tagged Christmas, Hope Stream Radio, Janis Cox, pace, peace, podcast, Word of God Speak on December 23, 2015 by JanisCox. I love this Scripture – It can be used as a benediction or prayer. God, may you fill us with all joy and peace as we put our trust in You. May we overflow with hope by the power of the Holy Spirit. As we head toward Christmas, calm our spirits, give us strength, wisdom and joy to celebrate the birth of Your Son, Jesus. In His name we pray, Amen. Christmas is just a few days away. We have been expecting it to arrive and it will. Here are a couple songs to put you into the hope, love, joy and peace of Christmas. “Come Thou Long Expected Jesus” is an Advent carol. The music is by Rowland H. Prichard and the lyrics are by Charles Wesley. And for that wonderful Holy Night. This song carries us away to Bethlehem like no other. Céline Dion sings O Holy Night. 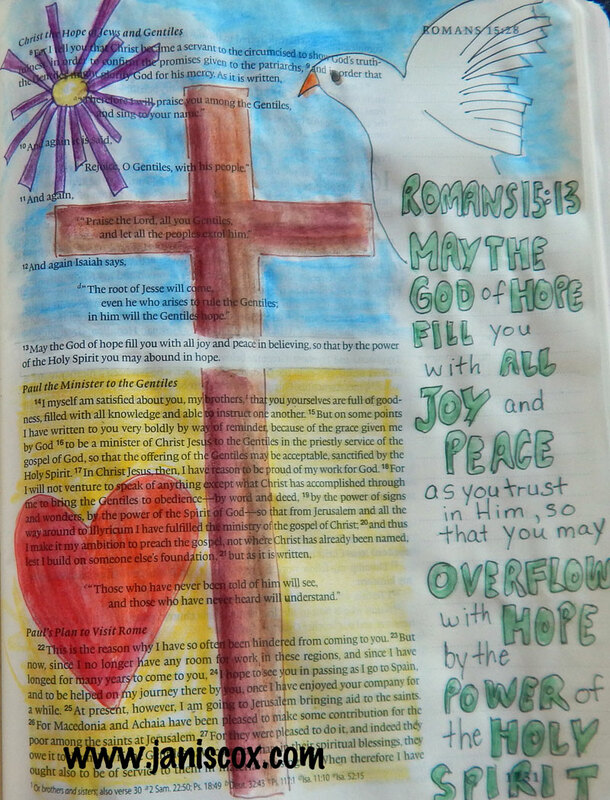 This entry was posted in Art & Scripture, Creative Tuesdays and tagged Advent, art, birth, Celine Dion, Christmas, come Thou Long expected Jesus, Jesus, O holy night, peace, Scripture, Youtube on December 22, 2015 by JanisCox. Word of God Speak – How Can We Find Peace this Christmas? 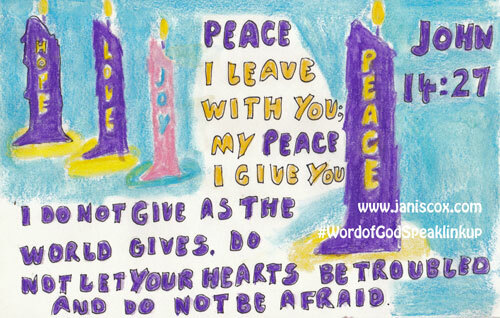 This is the last Sunday in Advent – PEACE. Here is my acronym for peace. Although I started studying 1 Corinthians 2:4-5, I decided to memorize another Scripture. It came from my looking at other references and seemed to fit best with this Advent week of PEACE. We will be memorizing Romans 15:13. See below. Following my SIMPLE Method of Bible Study I looked at 1 Corinthians 2:4-5. My message and my preaching were not with wise and persuasive words, but with a demonstration of the Spirit’s power, so that your faith might not rest on human wisdom, but on God’s power (1 Corinthians 2:4-5.NIV). I – Interpret the passage – check footnotes, references and commentaries. All of these passages turned me to the true meaning of Christ’s birth. The filling up with the Holy Spirit. Those who lived during His time on earth could see and feel His power. Now we can do the same through the Holy Spirit. M – Make a list of thoughts, questions and ideas. The week before Christmas – the birth of our Lord. We’ve discussed HOPE, LOVE and JOY. and now Jesus brings PEACE too. How can we find God’s peace? At the beginning of 2015 I found my WORD for this year – Intentional. Intentional for Jesus. I think it funny that at the end of this year I join Intentional Bloggers and Tribe Writers. It has been a year of change, of rethinking, of growing. I had to drop some first loves (Family and Faith Matters, and Under the Cover of Prayer Group Posts) and find my focus which is God’s Word. I must deliberately give my sanctified life to God for His service, so He can use me as His Hands and His feet (Oswald Chambers, My Utmost for His Highest). I’m very excited to see what God has in store for 2016. I haven’t discovered my WORD for 2016 yet but I am getting some strong ideas. I will get back to you early in 2016. P – Pray. After all your thoughts are expended – take time to talk to God and then to LISTEN to Him. L – Life Applications – Write down what you heard God speak. Rely on the certainly of God’s redemptive power and He will create His own life in people (Oswald Chambers, My Utmost for His Highest). This December has been filled with excitement by following Christ and not the world. We are not going home to Canada for Christmas this year (we celebrated the family Christmas last weekend – yes a plane ride back and forth). I’m watching and waiting to see what God has in store for us. I’m shaken by the news of the human trafficking that is happening around the world – and even in my province of Ontario. Watch the video from the Toronto Star and your eyes will be opened. I’m wearing a dress every day in December to remind me to pray and to advocate for those caught in human trafficking. This is a great reminder before Christmas. May Jesus be Christmas for you this year. May you shine for Him. May you be filled with the power of the Holy Spirit. Let’s be revived and revive others. E – Exit the study with a written prayer. Heavenly Father, thank You for Jesus – for His coming to earth to see, to share to teach. Create in us Your life so we can know You more. We rely on You. In Jesus’ name. Amen. Rely on the certainly of God’s redemptive power and He will create His own life in people (Oswald Chambers, My Utmost for His Highest). (click to tweet). Nothing can stop God from moving in His people – NO THING. (click to tweet). Please subscribe to my blog so you don’t miss a post. Also I would love for you to sign up for my newsletter – monthly or not so monthly (I promise not to fill your inbox). Recipes, life, paintings, updates on my writing. Four free devotionals with signup. Use them for meetings, for church groups, for letters to others. Please add your posts following the instructions below. If you want you can show Word of Speak Icon or my name on your blog and link on your blog. Here is my new picture. 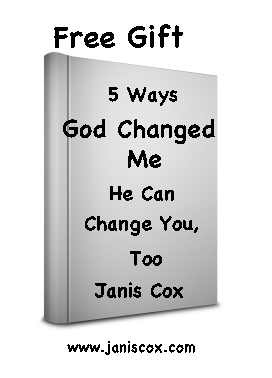 The link to use is http://www.janiscox.com/category/word-of-god-speak/ Make sure the posts you link are about God working in your life. No sales, or other posts allowed. Please add your links by following the instructions. Make sure you visit at least one – preferably two other posts. Give them support and encouragement. The link will be open until Wednesday night. By entering your link, you are allowing me to contact you by email to remind you of next week’s LINKUP. If you don’t wish to do this, please do not add your email address. And if you don’t put in your email address, I hope your memory is better than mine. This entry was posted in Simple Bible Study, Sunday Stillness, Word of God Speak and tagged Christmas, God's Word, Janis Cox, Jesus, peace, Power of Holy Spirit, Romans 15:13, Simple Bible Study Method on December 19, 2015 by JanisCox. The Lord is Spirit and where the Spirit of the Lord is there is freedom. Having the Spirit of the Lord – can that bring a freedom? Can it change lives? Please listen in to my podcast at Hope Stream Radio Where the Spirit of the Lord is There is Freedom. Let’s open our eyes to the possibilities of freeing those trapped in slavery and hopefully teaching them the salvation that comes from Jesus. Check out Ratanak International for a chance to change the world. This entry was posted in Hope Stream Radio and tagged 2 Corinthians 3:17, Expectancy, hope, Hope Stream Radio, Janis Cox, joy, love, peace, podcast on December 9, 2015 by JanisCox.